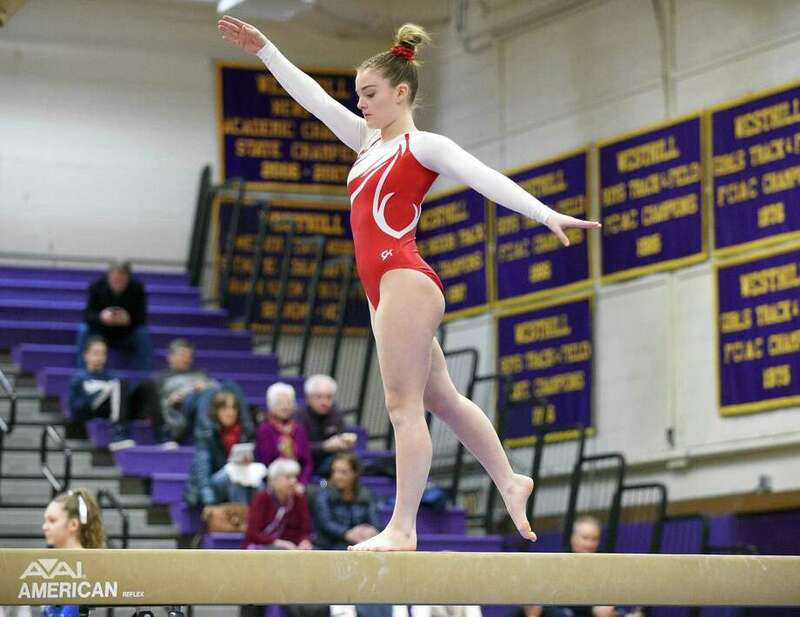 Greenwich’s Kelsey Fedorko competes on the beam in the Ro Carlucci FCIAC gymnastics championship at Westhill High School in Stamford on Saturday. It was Fedorko who led the Cardinals on the path to success in this first Ro Carlucci FCIAC Championship. The meet is now named in honor of the late Westhill gymnastics coach who was one of the founding members of the sport in the FCIAC. Fedorko tied for first in vaulting (9.2), tied for first on bars (8.7), won on balance beam (9.25) and was runner-up on floor exercise (9.30) on her way to winning the all-around title with 36.45 points. In addition to their experience, Greenwich displayed great fortitude Saturday. GHS senior Gianna Cardini injured her left arm during the uneven bars. However, with a fourth FCIAC crown on the line, Cardini insisted on competing on vaulting. She finished tied for second on vaulting with a 9.15 and took 12th place in all-around. GHS senior Elizabeth Marino was sixth in the all-around (34.9). There were a number of other top performers who had reason to celebrate Saturday. Ludlowe sophomore Ava Mancini tied for first on bars (8.7) and was runner-up on beam (9.15) on her way to second place in all-around (35.95). Trumbull senior Merritt Stevenson tied for first on vault at 9.2. Stevenson and Warde’s Caroline Garrett (tied for 2nd, 9.15) were the only competitors to perform the tuck yurchanko multi-flip move in the event. Stevenson was also second on bars (8.45), fourth on beam and floor exercise to place third in the all-around (35.60). Wilton senior Jessica Olin was FCIAC champ on floor exercise (9.4), tied for second on vault and fifth in all-around (35.0). TEAM SCORES: 1, Greenwich 135.1 points; 2, Ludlowe 133.9; 3, Wilton 132.1; 4, Warde 131.45; 5, Trumbull 128.55; 6, Darien 125.450; 7, Staples 122.650; 8, New Canaan 116.150; 9, Westhill 112.450; 10, Danbury 66.55; 11, Norwalk 48.6; 12, St. Joseph 41.850; 13, Stamford 24.4. VAULTING: 1, (tie) Kelsey Fedorko (Gr), Merritt Stevenson (Tr), 9.2; 2, (tie), Gianna Cardini (Gr), Jessica Olin (Wilt), Caroline Garrett (Warde), 9.15; 3, (tie), Elizabeth Marino (Gr), Ava Mancini (Lud), 9.10; 4, Tess Vincent (Warde) 8.8; 5, Lana Schmidt (Dar) 8.75; 6, Kaitlyn Moussignac (NC) 8.70. UNEVEN BARS: 1, (tie), Kelsey Fedorko (Gr), Ava Mancini (Lud), 8.70; 2, Merritt Stevenson (Tr) 8.45; 3, Caroline Garrett (Warde) 8.40; 4, (tie), Evelyn Hogarth (Lud), Tess Vincent (Warde) 8.30; 5, Elizabeth Marino (Gr) 8.25; 6, Lindsay Capobianco (St. Joseph) 8.0. BALANCE BEAM: 1, Kelsey Fedorko (Gr) 9.25; 2, Ava Mancini (Lud) 9.15; 3, Lindsay Capobianco (StJ) 9.10; 4, Merritt Stevenson (Tr) 8.85; 5, Caroline Garrett (Warde) 8.80; 6, Carter Siegel (Wilt) 8.65. FLOOR EXERCISE: 1, Jessica Olin (Wilt) 9.4; 2, Kelsey Fedorko (Gr) 9.30; 3, Lily Byrnes (Wilt) 9.25; 4, (tie), Merritt Stevenson (Tr), Gianna Cardini (Gr), 9.1; 5, Elizabeth Marino (Gr) 9.05; 6, (tie), Ava Mancini (Lud), Tess Vincent (Warde) 9.0.